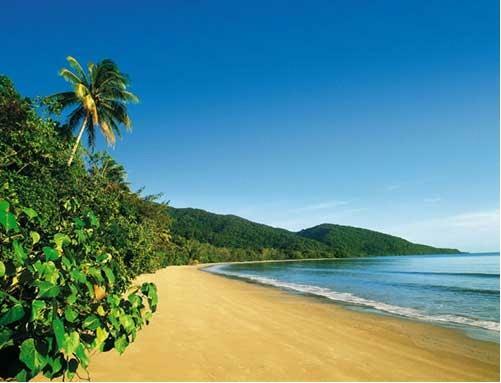 Perfectly nestled between the world heritage listed Daintree Rainforest and the clear blue waters and sandy beaches of the Great Barrier Reef the holiday desintation of Cape Tribulation is a wonderful place for a tropical retreat. The affordable accommodation at the Ferntree Rainforest Lodge has lots of in-room amenities and various room types to ensure that it is very affordable to the budget conscious holiday maker. Combining a range of resort style accommodation, friendly service and a great Cape Tribulation location the Ferntree Rainforest Lodge is the perfect place to go for a holiday. This affordable property also has lots of great facilities including lounge bar, currency exchange services, restaurant, outdoor swimming pool and tour desk. Set harmoniously within the vivid green landscape, Ferntree Rainforest Lodge's magnificent gardens are designed to attract some impressive rainforest creatures. From the comfort of your room, you can witness the operatic display of colourful butterflies and birds, as they dance in this spectacular environment. So come and experience the beauty and wonder of Ferntree Rainforest Lodge and stay in the heart of Cape Tribulation. Garden Hotel Room : Sleeps up to 4 guests on 1 King Bed & 2 Single Beds or 4 Single Beds. Poolside Hotel Room : Sleeps up to 3 guests on 1 King Bed or 2 Single Beds. Private Cabin : Sleeps 1 guests on a Double or Single Bed.